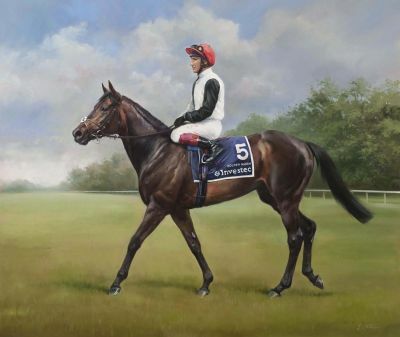 Excellent winner of the Epsom Derby, the Eclipse Stakes, the Irish Champion Stakes and the Qatar Prix de l'Arc de Triomphe, Golden Horn was homebred by Anthony Oppenheimer's Hascombe and Valiant Studs and trained in Newmarket by John Gosden. His jockey, Frankie Dettori, rates him as probably the best horse he has ridden. By Cape Cross, sire of Sea The Stars and Ouija Board, he is out of Fleche d'Or by Dubai Destination.